Hilldene Primary School MUGA – The students at Hilldene Primary School in Romford, Essex had a big surprise on their return from the summer holidays after we installed a brand new multi use games area. The 30m x 15m multi use games area (MUGA) features 3m high 868 fencing with super rebound for maximum ball bounce. Due to the players being of a younger age, there was no need for heavy duty fencing. However, the school opted for our heavy duty curved-back open goals as they wanted them to withstand high usage. Our open-back goals are DDA compliant so double up as additional entrance points into the court. Because of this, the court features the one pedestrian gate which can be fully opened 180 degrees to allow for wheelchair access. 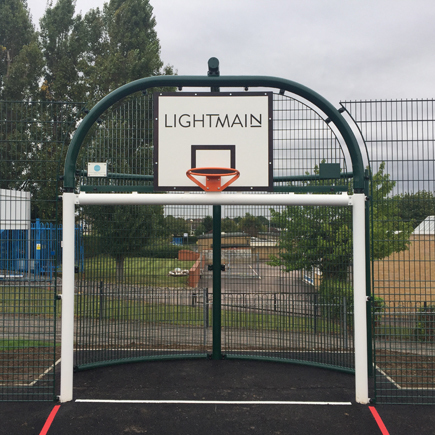 Each goal unit features a basketball hoop which we manufactured at a reduced height to suit the age of the players.